In 1975, the New York Giants were a team without a country. They were in the wilderness. Their stadium in New Jersey was still being constructed, and the Yankees (the Giants’ old landlord) had kicked them out to do renovations. So the Giants had no place to play home games, and to make matters worse, they were terrible. Facing an uncertain future, the team did the only thing they could do. They designed a new logo: an italics-mixed-case-disco-racing-stripe-NY emblem of questionable decision-making. It was the NFL uniform equivalent of a drunk tattoo. It was awesome. And it only lasted for that single season. The Giants ended up playing through the year at Shea Stadium in Queens. In 1976, the team moved in to their home at the Meadowlands, and wasted no time in changing to a logo that was NY/NJ-neutral. It was their banner through two epic Super Bowl victories. Here’s to one more: BEAT NEW ENGLAND! – Woody Allen, Sport Magazine, Nov. 1977. Allen is sent by the once-great Sport to interview Earl Monroe for a cover story. But Pearl never shows and Allen is left to make small talk with “Earl’s lady.” A true fan, Woody swallows the snub and writes a great profile of the arthritic Knicks captain anyway, full of signature wit and basketball wisdom. I read a transcript of the article once before, but never saw the original scans until yesterday, thanks to the excellent Oakley & Allen. True holy grail status! Check it out. In 1971 I wrote and shot a scene for Annie Hall involving the Knicks and Earl The Pearl. I was extolling the concept of the physical over the cerebral, so I wrote a fantasy basketball game in which all the great thinkers of history – Kant and Nietzsche and Kirkegaard – played against the Knicks. I cast actors who looked like those philosophers to play those roles and they played against the real Knicks. We used the players on the team at that time including Earl, Bill Bradley and Walt Frazier, and we shot it inside Madison Square Garden after the last game of the season. Of course the Knicks were smooth and beat the philosophers easily; all their cerebration was impotent against the Knicks. But I cut the scene from the picture, not because it didn’t come out but because I had to keep the picture moving and it was too much of a digression. It didn’t break my heart not to use it in the film. I always feel that anything I cut out of a film is always a mercy killing. 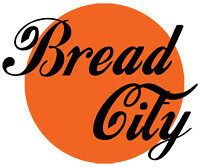 Another example of the profound cultural impact the Knicks had on New York during the early 1970s. Willis Reed and company brought pro hoops to the forefront of the city’s popular consciousness for the first time, winning two championships along the way. Before then, the NBA wasn’t really legit in NYC, and people only cared about college ball. It was the most volatile era in New York’s modern history. A time of grime and racial tension. Crime skyrocketing. Junkies ruling the parks. Student protestors and construction workers brawling on Wall Street. The South Bronx burning down to rubble. Cops with German Shepherds patrolling the graffiti-covered subway cars. 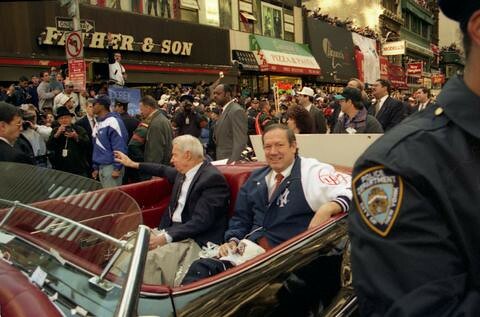 And yet amidst all the antipathy, the entire city was united in its passion for the Knicks. It wasn’t because of one or two individual players. It was because together, the Knicks’ game aesthetically complemented New York so perfectly. A melting pot of styles, races, and personalities that melded to form an unstoppable team. Flashy at times, but blue collar at heart, with a deep bench that could outlast top-heavy teams like Wilt Chamberlain’s Lakers. All that remains of Woody Allen’s 1971 Knicks footage is the still frame below. It was used as a lobby card during Annie Hall‘s original theatrical run. According to Allen, the rest of the scene was destroyed. 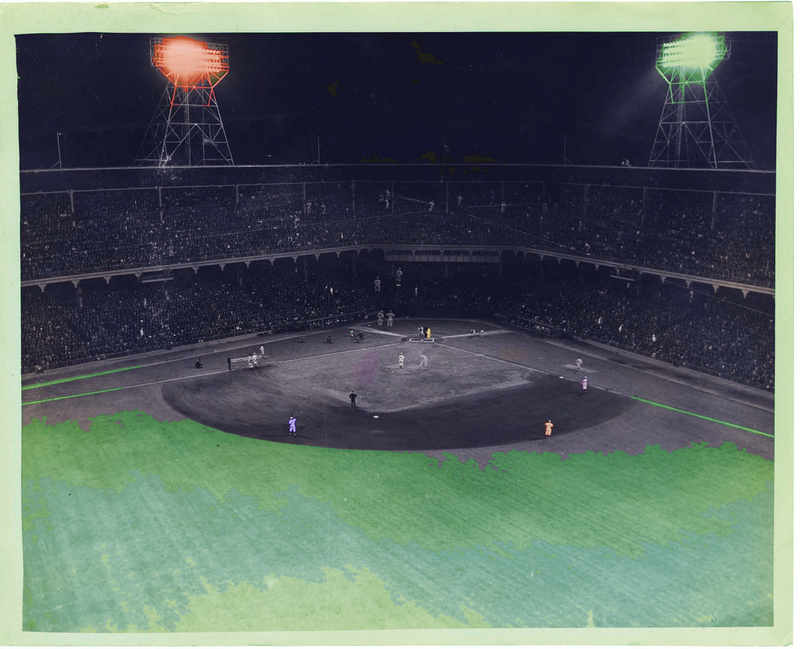 The first night game at Ebbets Field was played on June 15, 1938. Colorized in 2009. Madison Square Garden, aka The Garden, aka The Mecca, is on its fifth life. 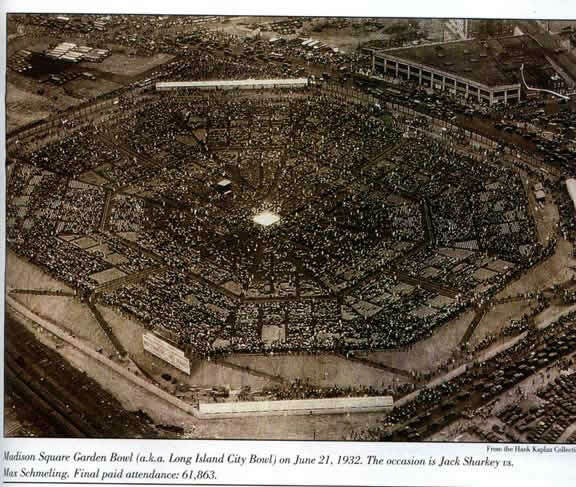 Sixty years before Marbury’s MSG there was a crazy open-air Madison Square Garden Bowl in Long Island City, and before that one were the first two arenas actually on Madison Avenue in the late 1800s. But it was Madison Square Garden III, a behemoth built by a boxing promoter on 50th Street and 8th Avenue, that cemented its legend status as the World’s Most Famous Arena. 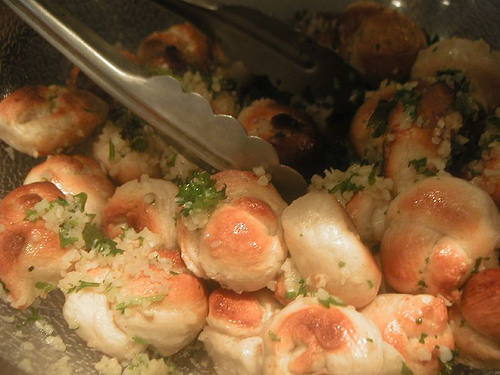 MSG III’s grand opening event was a six day indoor bicycle race in November of 1925, but boxing and ice hockey were the stadium’s real bread and butter, drawing massive crowds. It became such a huge deal for a boxer to appear at the Garden that even the big shots got stage fright in the locker room. 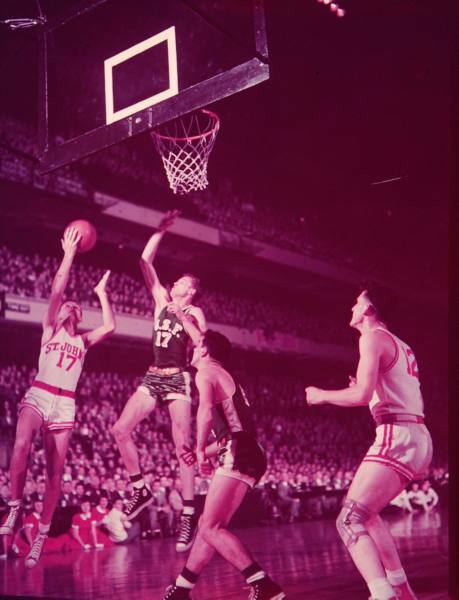 The Knicks made their Garden debut in 1948, but college ball pulled in more at the III. Below, St. John’s faces U. of Frisco in some throwback NIT action. Check how bad the old blue seats were. Cigarette/cigar smoking was allowed and arena ventilation was nonexistent. If you sat in those way-upper decks, by the second half it was like watching a basketball game from inside of a house fire. MSG III was torn down in 1968 and remained a Hell’s Kitchen parking lot for twenty-one years. It’s now the site of One Worldwide Plaza, a 49-story skyscraper that is currently the 87th tallest building in the world. Who didn’t skip school for this?